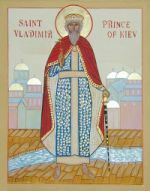 This weekend we are blessed to be able to venerate the Holy Relics of Great Prince Vladimir, Equal to the Apostles. 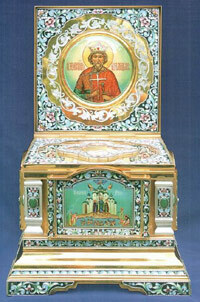 The Holy Relics arrive at St.Vladimir’s on Saturday, Oct. 9, at 5pm. The church doors will remain open on Saturday, Oct. 9, 5pm until 10pm, and on Sunday, Oct. 10, 9:45am until 10pm. For those interested, the CTV interview with Fr. Vladimir filmed in our church will be aired on Saturday, October 9, at 6 pm. Please refer to www.archdiocese.ca for more information about the mission. The Bishop will have personal appointments with any wishing to meet with him on Friday afternoon from 1:30 pm — 4:00 pm. To make an appointment, please contact Ksenia. Vespers on Friday, September 10 at 5:30 pm preceded by official welcome of offering of bread and salt. Also on Friday evening after Vespers, September 10, there will be a parish potluck dinner and evening social event with the Bishop. 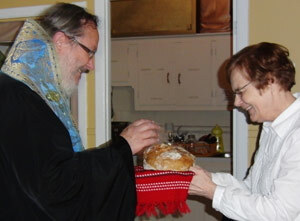 On Saturday, September 11 after the Liturgy, there will be a potluck lunch with the Bishop. He will have to take his leave by 1:30 pm at the latest in order to go to the airport. The service on Sunday, September 12, is cancelled as the Saturday feastday Liturgy is replacing it on this very special weekend. Wednesday evening Readers Vespers (September 8) is also cancelled. Thank you in advance for noting all these events and welcoming our new Auxiliary Bishop to St. Vladimir’s. For those of you who don’t know him, it will be a chance to make his acquaintance and talk with him. As announced last Sunday, the parish potluck dinner with Bishop Ire’ne’e will be held after Vespers on Friday, September 10 at the home of Peter Efthymiadis, 140 Purcell’s Cove Rd., Halifax. Thank you in advance for any contribution to the dinner that you are able to make. For any further information, please contact Peter by phone or email. Thank you. All members and friends are welcome! Our fundraising Yard Sale is being held at St. Vladimir’s on June 12, 2010. If you can volunteer some of your time on Saturday morning, June 12 or the previous Friday evening (June 11, 5:30 — 8 pm), please let Reuben know. We also need anything that you no longer use but which is still in good condition, and clean. It could be small household appliances or any kind of houseware, small household items, clothes, books, CD’s, DVD’s, toys, etc., in other words, anything that you think could be easily sold. Please bring in your items as soon as possible, BUT... Remember if it does not sell, you will have to take it back home. This Sunday, May 23, is the Great Feast of Pentecost (followed by Kneeling Vespers). We will be celebrating it at the chapel of Fr. Vladimir in Pinehurst, near Bridgewater, at 10:30 am. It is an easy drive of 1 hour 15 minutes on Highway 103 going west towards Yarmouth. If you need a ride, or any further information, please contact leaslee or Reuben. After the Divine Liturgy, there is a potluck picnic at the home of Fr. Vladimir. All are welcome. Thank you and see you there! Please note that we also will be celebrating Father Vladimir’s birthday, which is on May 22. As the Feast of Nativity (Jan 6 Evening) is rapidly approaching, you will find a message below from Fr. Vladimir about Confessions. Please find in the Synaxis room the sign-up sheet for the Nativity Potluck dinner. It will be held as usual upstairs in St. George’s Church Hall at the end of the Nativity Liturgy. Due to this weekend’s blizzard, services are cancelled. Weather permitting, there will be Typika on Sunday, Jan 3, at 10 AM. Confessions before Nativity are to be scheduled as follows: Tuesday, Jan 5, starting at 3:30 PM until early evening. Wednesday, Jan 6: All day, up until 5:00 PM only. Please contact Fr. Vladimir as soon as possible for an appointment on either of these two days. Christmas Liturgy will start at 9:00 p.m.
After the Liturgy there will be a Potluck Nativity Dinner upstairs in St. George’s Church Hall. All are welcome to the Liturgy and the Dinner. Please take your contribution to the potluck dinner directly upstairs to the Church Hall before Liturgy. Thank you in advance for your contribution and your presence. See you there!